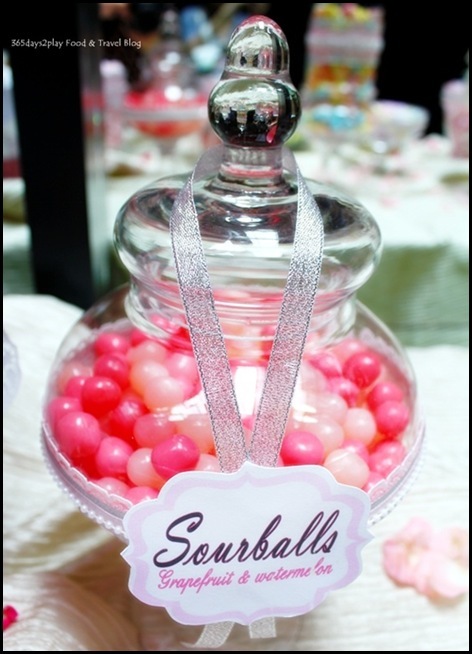 I love whimsical weddings and I have a soft spot for Candybars after the amazing experience I had at my own wedding. 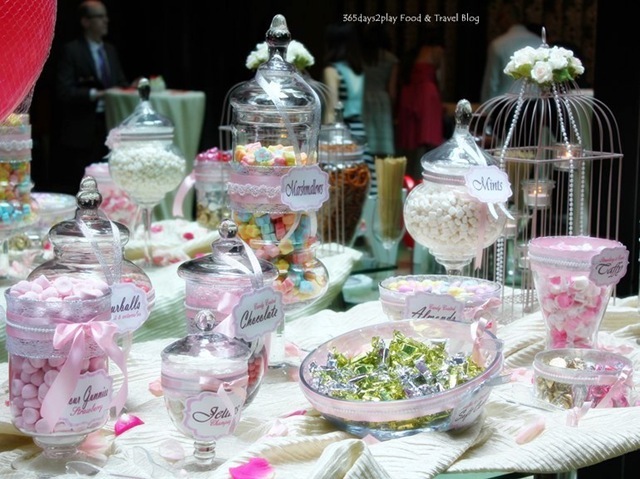 I didn’t really get to enjoy the full glory of my wedding Candybar, as you can well imagine that I was everywhere but at the Candybar entertaining my wedding guests! The Candybar goodies were completely wiped out by the time the wedding ended, and I was quite regretful that I did not even manage to save a single morsel to reminisce. Only pictures remind me of the wonderful array we had that day. 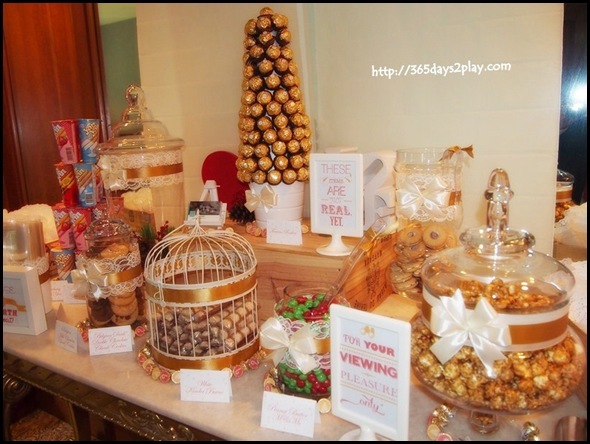 So when I heard that my good friend was going to have a Candybar catered by Sweet Moments for his wedding at Crowne Plaza Changi Airport, I was overjoyed. Apparently he took inspiration from my wedding, woo hoo! Pay back time Mister! I was going to take the opportunity to raid his candy bar and enjoy it to the fullest! My friend had a whopping 14 different varieties of candy, chocolates and marshmallows! This was in addition to the chocolate fountain as well as strawberries too! What a feast! As you can see, my friend chose a very pink theme! No matter whether young or old, candy bars will never fail to put a smile on anyone’s face! I really do think that candy bars will become the de rigeur for all weddings in the future, just like champagne pouring or having a wedding cake! Remember you heard it here first! For a good part of the wedding, I’d been cracking my brains to come up with something creative yet still wedding worthy if you know what I mean. Didn’t really want a live band or singers because seriously, you spend a bomb and people hardly even notice that they’re there. Those who do happen to sit near the stage and I know of people who have complained of the noise! I wanted something a little whimsical, to sort of make me feel better that I didn’t get to have a garden wedding. A garden wedding is something that is so pretty, and I think most brides would consider it, but to be realistic, most guests hate garden weddings thanks to the Singapore weather! And trust me, as a bride, you don’t want to be worrying about whether it’s going to rain either. I made the decision not to have a garden wedding, but I still wanted to have my cake and eat it. And that’s when I thought of having a candy bar! It doesn’t seem such a common thing for now, and I hope I’m one of the first few to set the trend going! One of the best parts about preparing for my wedding were the parts where I was researching on candy bars. So many whimsical and eye popping candy bars pictures out there!! 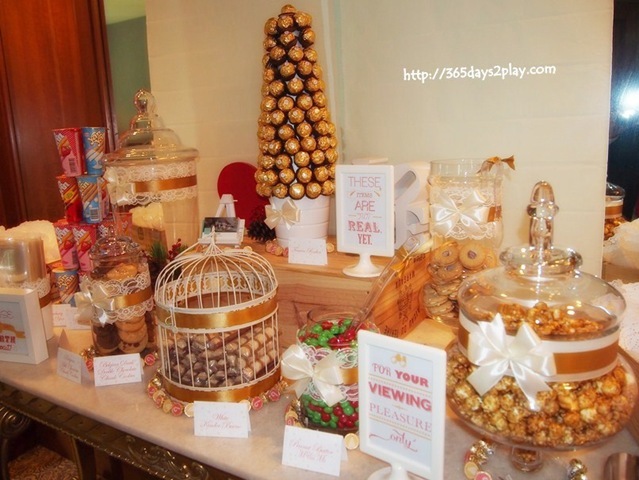 With all manner of variations from the types of candy to whether you want biscuits, macarons, cupcakes, canapes and what have you! I was so lucky to be able to get a sponsor JOandJARS to come set up a Candy Bar for my wedding! Check out the little goodies they provided!